A Cambodian woman hangs her mosquito net in the temporary dwelling in the fields that she and her husband are clearing to farm. Concerted campaigns in the Greater Mekong Subregion [GMS] to radically reduce the impact of malaria has lifted hopes a vital target to eradicate malaria from the region may be within reach. Deyer Gobinath, a malaria technical officer with the World Health Organization (WHO) in Thailand, said the outlook is positive for eliminating severe forms of malaria across the region within the next decade. 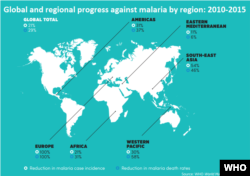 The goal is for most of the GMS countries by 2025 to try and eliminate falciparium malaria – the most severe form of malaria – the falciparium malariia - and then by 2030 basically all forms or all species of malaria,” Gobinath said. In 2015, WHO leaders said there were 14 million malaria cases across Southeast Asia, resulting in 26,000 deaths. Globally, in the same year, the WHO reported 438,000 lives lost, mostly in Africa and warned that 3.2 billion people – almost half the world’s population – face health risks from the disease. The campaigns in Southeast Asia cover Myanmar, Laos, Thailand, Cambodia and Vietnam, all reporting consistent declines in mortality rates, by as much as 49 percent since 2000. Populations most vulnerable to the mosquito-borne disease are largely in remote border regions, isolated from infrastructure and immediate medical support. The key areas of concern lie in regions between Thailand and Myanmar – also known as Burma – and in Cambodia among others. But Saw Nay Htoo, director of the Burma Medical Association, said collaboration between medics and local communities has had a positive impact in reducing malaria’s impact. The fight against malaria is largely based on a combination of drugs known as Artemisinin-based Combination Therapy, or ACT, as the main line of drug treatment. The World Health Organization's Gobinath said Thailand’s medical infrastructure and funding support have all contributed to lowering the numbers of malaria cases. “For malaria in Thailand here’s been quite a remarkable decrease – a steady decrease, decline in the number of confirmed cases of malaria. In the past 10 years or so something like 30,000 cases in 2012; to 2015 it was 19,000 to 20,000 cases. So it’s been a gradual but persistent decline of confirmed malaria cases,” he told VOA. WHO officials said attention needs to focus on migrant worker populations moving across the region’s borders. Thai health authorities have taken steps to enable medical access to migrant populations at risk of malaria, largely in remote border areas. But challenges remain, said Maria Dorina Bustos, a WHO technical officer with responsibilities for monitoring drug resistant strains of malaria across 18 countries in the Asia Pacific. Dorina Bustos said the region with drug resistant forms of malaria is spreading. “The Thai-Cambodia or the Thai-Myanmar border, you need to think about the Thai-Laos border because the Southern Laos drug resistance is also about evident – is documented, it is also there. And what is actually more alarming is happening in the Cambodia side,” she told VOA. She said drug resistance becomes evident in the delay in clearance of the parasite from the patient. Dorina Bustos says the use of fake drugs and self-treatment also opens the way to drug resistance. “What we are seeing in the last five years is that it is really emerging in the most parts of the region – initially just in the Western border of Cambodia and now it has also spread to the east and almost the whole country,” Dorina Bustos said. She said there is a need for close monitoring of major population centers – especially in India and Africa – to ensure successful treatment and avoiding issues of the use of fake medicines. A positive note has been ongoing investment and research in new drugs, including commitments by major pharmaceutical industries.